It's time to replace the mop bucket! 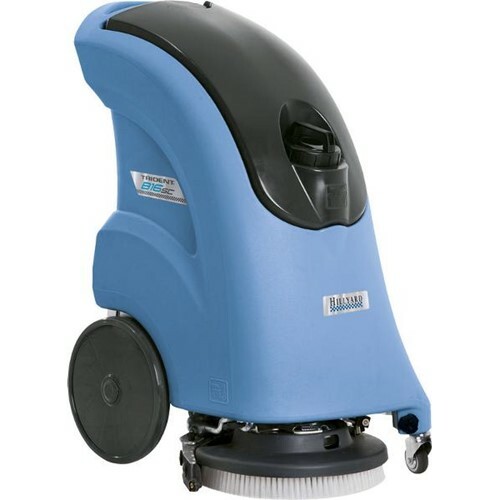 The Hillyard Trident B16SC is a compact walk-behind, brush-assisted, automatic scrubber that makes cleaning simple and easy. It's designed to deliver high productivity and low total cost of ownership. Clean up to 13,000 sq. ft. per hour with the 16" disc scrub head. The small 27" x 18" foot print makes it ideal for the most compact spaces. Easily maneuver in tight quarters. The B16SC is perfect for car dealerships, kitchens, and any tight spaces. The B16SC comes with onboard battery charging, simplifying recharging. The B16SC's powerful suction motor is paired with a parabolic squeegee that swings around the brush and leaves the floor dry and safe.